Finding My Voice Through “Quotes and Notes” – Johntheplantman's stories, musings, and gardening. In case you need to know where the “quotes and notes” came from, here is the explanation. Recently, throughout the fall and winter, I have seen some interesting changes in my writing life. I have been finding my voice. As you may know, a couple of years ago I lost my vocal cords to a cancer operation called a laryngectomy. I spent an interesting six months not being able to talk at all and then I was fitted with a tiny prosthesis in my throat that allows me to use other muscles to talk. I have been getting better and better at talking. Our new book is almost ready to print. The publisher is working on the formatting now. I knew the release date was coming and last October, in observance of Breast Cancer Month, I told my Facebook followers that I would post a motivational and annotated cancer quote every day for the entire month. I didn’t know if I had it in me to write such a post every day for 31 days, but I pushed myself. I succeeded. The effort was well received. A lot of people started following and several cancer victims thanked me profusely for the help they got from the posts. At the end of October I said, “Well, there it is, I hope you liked it. I’m done.” I received a lot of requests to continue writing the motivational posts so I told Dekie that I wondered if I could do a quote and note every day for a year. It’s a daunting project but now I am over two months into it and going strong. 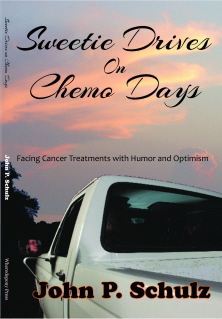 I switched from an emphasis on cancer to one of hope, optimism, and happiness. Here is my favorite post from that site. (click on the title). If you wish, you may go to the site and sign up to receive the quotes from the site in an email. As one may become stronger by practicing optimism, the same may be said about successfully dealing with ill fortune. When I lost my vocal cords several years ago and had to live for six months without a voice at all before getting a prosthesis, I made up my mind to become a motivational speaker some day. 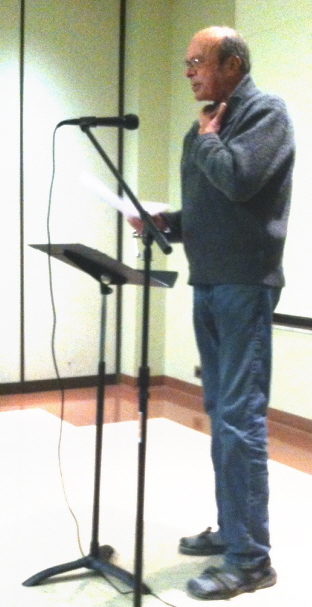 My voice is evident in my writing and last night I gave a successful reading for the Rome Area Writers organization. What a good feeling that was! Push on and overcome. While you’re at it, share a smile. John Schulz gives a motivational talk to the Rome Area Writers. Thank you for visiting John the Plant Man. John, I was so pleased to hear you read your wonderful posts at Rome Area Writers last week. You made me want to push ahead and keep on writing. And you’re right; everything really is going to be all right. I was so comfortable experimenting with my voice at the Rome Area Writers’ meeting. You, as president and moderator, make the meetings such a comfortable experience. Can’t wait to read the book and share it with others! Can we pre-order? Thank you for all the love and support you’re spreading, John! Keep it coming!